Asana Cycles is about integrating the bicycle into our daily lives. The focus is simplicity, freedom and the quality of life that follows. 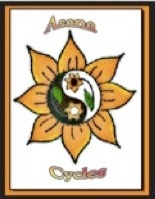 Asana Cycles is your “bicycle practice”. Life on the bike is about YOU. Asana Cycles is offered as a guide for your endeavor. Asana is a sanskrit word, which basically means posture. It is a a root word, as in “Tadasana” or Mountain Pose. “During all poses you concentrate on the space between the eyebrows, the third eye, the seat of the mind. As you concentrate, your mind and thoughts slow down, cravings and desires diminish, and you feel calm. It’s another way of enhancing mental focus and preparing yourself for meditation. Each asana physically reflects a particular attitude: acceptance, surrender, balance or openheartedness. As you move into a posture, your body manifests the physical form of the attitude associated with it. You bypass verbal or rational understanding but you understand the pose emotionally. In other words, standing tall and firm in Tadasana gives you the steadiness and foundation of a mountain. When you feel closed to someone or to some experience, a backbend will open your chest as well as your heart. If you’re shy, backbends will help you greet the world with more confidence. They also correct your spine and posture. To master the balancing poses, it’s useful to employ some physics. Move the body weight toward the toes, off the heels, then press the toes into the ground. If you picture a tree, imagine your foot as the roots digging deeply into the earth and it will help you find stillness and correct your posture.